#1 in New York City: SUPERSTRUCTURES consistently ranks first among professional firms in the New York region, based on dollar volume of exterior restoration projects completed, according to annual rankings published by ENR Engineering News-Record New York. Volume of projects is not necessarily a measure of proficiency – but in this case it is. Exemplary performance on a project attracts more assignments. More assignments mean more opportunities to learn, more feedback from the field, and even better performance on the next project. It is rare to encounter something we have not seen before. Nonetheless, we approach each project with a fresh eye and genuine enthusiasm. With a staff currently totaling 89, we have more licensed Professional Engineers and Registered Architects than any firm of comparable size in our field. We have assembled, in-house, virtually all of the complementary skills required for the projects we handle. Our vertically-integrated team includes architects, structural engineers, conservators, scientists, cost estimators, and information technology experts. The diverse professionals on our team have years of experience working together – in some cases they sit next to each other. We can assemble the right team for every assignment. Our work is reward in itself, but it’s always nice to be recognized. The New York Landmarks Conservancy’s Lucy G. Moses Preservation Award honors individuals, organizations, architects, craftspeople, and building owners for extraordinary contributions to preserving the City. It’s considered the “Oscar” of the preservation community. SUPERSTRUCTURES won its first Lucy Moses Award in 1996 for structural engineering work on Grace Episcopal Church in Brooklyn Heights. We’re currently enjoying a six year “streak” in which at least one of our projects has received a Lucy Moses Award. Four of the six recent winners have been public sector projects, completed by the lowest bidding contractor. In 2011, the structural restoration of the Park Hudson Garage won an Award of Excellence from the International Concrete Repair Institute. In 2013, our exterior restoration of Thomas Hunter Hall received the Restoration Award from the Friends of the Upper East Side Historic Districts. In 2014, SUPERSTRUCTURES received a “Lifetime Achievement” award, the Sydney Strauss Award presented by the New York Society of Architects. The GSA has recognized the Conrad B. Duberstein U.S. Bankruptcy Court project in Brooklyn, NY, with a Design Excellence Award. 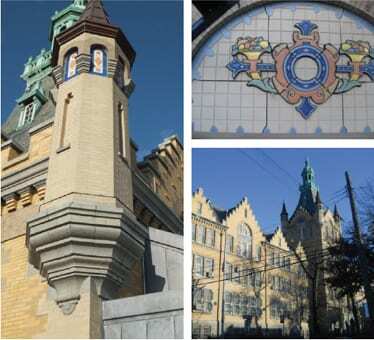 The six-year, $61.7 million project included the replication of 16,000 terra cotta units, granite cladding restoration, and replacement of slate roofs and gutters. SUPERSTRUCTURES, as a member of the Construction Management team led by Lend Lease, participated as Commissioning Agent throughout the project duration. Our commissioning services encompass historic preservation, structural engineering, materials conservation, and waterproofing. This project, with its vast amount of data, was a quintessential opportunity to enhance our commissioning services through the use of our proprietary Asset Information Manager (AIM) software. 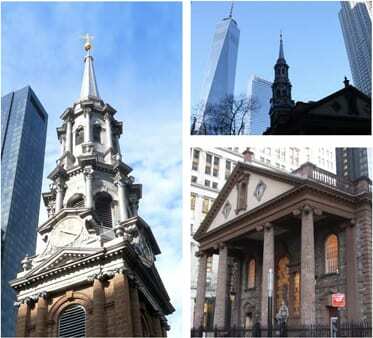 St. Paul’s Chapel in lower Manhattan is part of Trinity Wall Street parish. It is among the very few 18th century buildings remaining in New York City, and is the most notable both architecturally and historically. It has been deemed one of the two finest examples of Late Georgian church architecture in the United States. Thomas McBean designed St. Paul’s as a rustic interpretation of the famous St Martin-in-the-Fields in London, England. The east and west porticos of the chapel, its clock tower, and steeple were the focal points of the restoration. One goal was to retain as much of the original building fabric as possible. After extensive research and discussion between SUPERSTRUCTURES, the parish, and the New York City Landmarks Preservation Commission, it was decided to restore the building as much as possible to its condition as of 1929. No major alterations had occurred since then and it was the earliest period for which overall conditions could be reasonably be verified for a historically cohesive restoration. The New York Landmarks Conservancy has recognized the Conrad B. Duberstein U.S. Bankruptcy Court project in Brooklyn, NY, with the prestigious Lucy Moses Award for outstanding preservation efforts. The six-year, $61.7 million project included the replication of 16,000 terra cotta units, granite cladding restoration, and replacement of slate roofs and gutters. 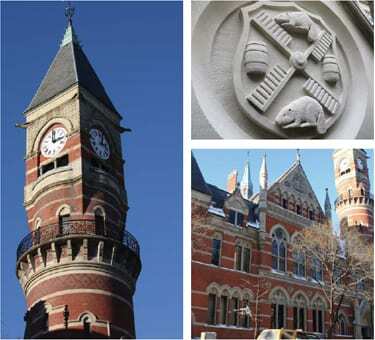 Widely thought to be one of the finest Victorian Gothic buildings in the United States, the Jefferson Market Branch of the New York Public Library is one of the most beloved landmarks in Greenwich Village. The building is not only prized for its original design, but as one of the first examples of an adaptive re-use project in the United States – a veritable landmark in the history of landmarks. Given this context, the current exterior restoration project sought to preserve both stages of the building's development as being historically important. As architect, structural engineer, and conservator, SUPERSTRUCTURES provided comprehensive investigation, design, and construction administration services for the complete exterior restoration. Some structural issues were also investigated and addressed as required. 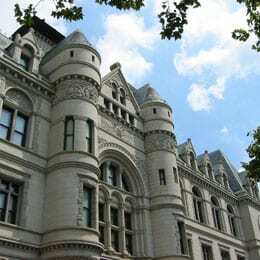 The project was managed by the NYC Department of Design and Construction for the New York Public Library. Originally constructed in 1898 to serve New York City as a public school, this 5-story Collegiate Gothic building on Manhattan's Lower East Side was designed by C.B.J Snyder, the then Superintendent of School Buildings. It currently serves as a community arts center focused on the preservation and presentation of Latino culture. The building’s façade, characterized by its steeply pitched roof line punctuated by dormers and decorative features, had suffered extensive deterioration by the time the project was initiated. SUPERSTRUCTURES provided comprehensive investigation, design, and construction administration services for the complete exterior restoration. The Department of NYC Cultural Affairs and NYC Department of Citywide Administrative Services funded the project, which was managed by the NYC Department of Design and Construction. The Rod Rodgers and Duo Multicultural Arts Center on East 4th Street in Manhattan was built in 1889 and is now owned by the City and managed by Fourth Arts Block, a non-profit organization. The 5-story building is located in the city's only designated Cultural District. Its unusual façade often draws the eye of passersby – particularly the circular iron fire escape leading down from a loggia on the fourth floor, screened from the outside by perforated iron mesh. Also notable are the large French windows on the second floor, and classical detailing. The exterior restoration, comprising repair or replacement of almost every visible element of the building and requiring expertise in a host of materials, has resulted in an impressive transformation. 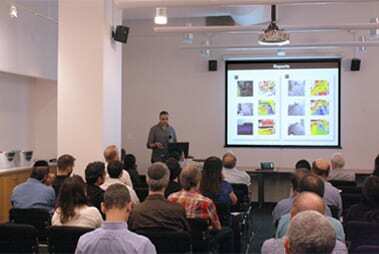 The project was managed by New York City’s Department of Design and Construction. SUPERSTRUCTURES provided investigation, design, and construction administration services. Newtown High School is a large secondary school in the residential neighborhood of Elmhurst, in western Queens. 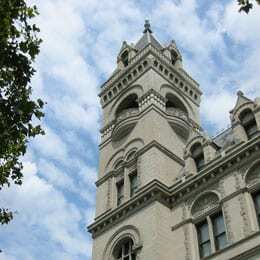 It is one of Queen's most prominent buildings, and occupies an entire city block. Newtown High School celebrated its 115th anniversary in 2012. The renovation project consisted of comprehensive exterior envelope repairs. Considerable skill in documentation and construction was demonstrated with the replacement of poly-chrome terracotta ornament and reconstruction of the four secondary turrets and their copper roofs. 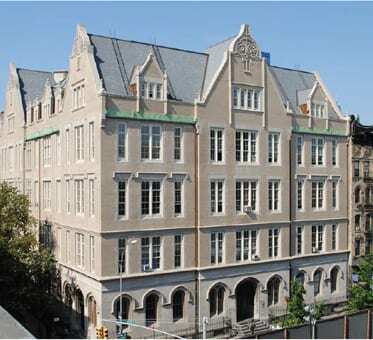 The project was completed for the New York City School Construction Authority. The MacIntyre Building at Broadway and 18th Street was built in 1890-92 as an office building. The structure, now a cooperative apartment building, has been recognized by the Landmarks Preservation Commission "as one of the most distinctive and distinguished in the neighborhood," which, given the wealth of estimable buildings in the vicinity, is high praise indeed. 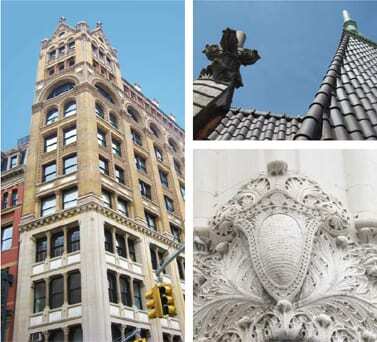 The exterior restoration and preservation work at the MacIntyre, comprising a masonry façade restoration and roof replacement, offered some special challenges - the AIA's Guide to New York City memorably characterizes the building's style as "Unspeakable eclectic: a murmuration of Byzantine columns, Romanesque arches, Gothic finials and crockets - the designer used the whole arsenal of history in one shot." SUPERSTRUCTURES provided comprehensive investigation, design, and construction administration services for the complete exterior restoration. Expertise must be nurtured. SUPERSTRUCTURES is a nexus of education in the art and science of restoration. At our on-site conference center we regularly host seminars for staff and clients, including presentations from our own experts, and from manufacturers’ technical representatives introducing new or improved product lines. Seminars have covered a range of topics including steel, concrete, brick, copper, cast stone, sealants, roofing, stucco systems, and terra cotta. SUPERSTRUCTURES is an AIA registered provider of Continuing Education Units (CEU’s) required for registered professionals in the State of New York. In the fifteen years of the program’s existence, representatives of hundreds of organizations have earned thousands of CEU’s. Beyond our internal programs, our employees participate in outside seminars and convocations sponsored by industry organizations as attendees, or frequently, as presenters. US Green Buildings Council (USGBC). SUPERSTRUCTURES was founded in 1981, when the two original partners Paul Millman and David May were young enough to occasionally be mistaken for interns when they visited a job site. In 1969, they had found themselves sitting at opposite desks in the first year architecture studio at Cooper Union, since their last names both started with “M.” They followed separate paths after graduation (David – construction, Paul – engineering graduate school at MIT). When the firm opened, they signed a lease for office space at 853 Broadway on Union Square that David found on a bicycle search of (back then) marginal but affordable locations. There was enough room for two desks to face each other, plus a bit of breathing room. The firm remained in the same building for 26 years, gradually expanding its leasehold. The firm’s first few years was a general practice – structural engineering, architectural projects, building code consulting. We were known for completing unusual or difficult assignments – placing a swimming pool on the roof of a townhouse, design of an unconventional foundation system for a Bronx urban renewal project, seemingly impossible DOB reconsiderations, inserting a museum in an unsuccessful pedestrian plaza beneath a high rise. After a few years of general practice, the partners looked around and decided they could have the greatest professional impact in the field of building restoration – exteriors and structures. 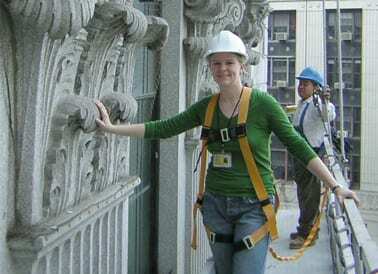 New York City Local Law 10 of 1980, the original façade inspection law, had recently been enacted. At the time, most exterior repair work was specified by consultants who would, for example, circle a crude drawing of a parapet with a note saying “repair as required – see specs” and include a booklet of generic specifications. (Unfortunately, some still operate this way.) We felt that project stakeholders deserved better, that projects could benefit from an infusion of professional discipline. That belief was influenced by the partners’ education at The Cooper Union (for the Advancement of Science and Art). They were taught that design and technology constitute a continuum, and that every problem, no matter how prosaic, deserves an elegant solution. The firm has been expanding on that conviction ever since. That’s why we treat every building like a landmark, and believe that clear expressive drawings are a part of that elegant solution. Paul first became interested in CAD when he worked on some of its earliest embodiments at MIT in the mid 1970’s as part of the “Architecture Machine” group. He was motivated by his belief in CAD’s promise, and in part by his recognition that hand drafting was not his strength – as opposed to David, who drafted drawings that were works of art. We became one of the earliest adopters of CAD in the mid 1980’s. The first few times it ran, our entire office would stop to watch our HP 8 pen plotter. A single complex plot took about an hour. Our CAD documents were featured at the 1987 exhibition of AIA Computer Images of Architecture at The New School. Our work was surrounded by computer renderings produced by some of the largest firms in the city. Ours were the only “working drawings” on display. Our CAD capability brought us some interesting assignments. One of them was an ornate fountain that dominated the living room in the penthouse apartment of Trump Tower. A fountain designer had sketched 32 water jets surrounded by ornate, curvilinear onyx stonework. CAD gave us the ability to translate his hand sketch into construction documents accurate to within 1/32 of an inch, constituting an absolutely waterproof enclosure. That was almost 30 years ago – we’d have heard by now if it leaked. In 1997, Vikrant Sampat (who joined in 1986) and John Galetta (who joined in 1990) became partners in the firm. With the formalization of their executive roles, the firm’s growth accelerated. In 1998, we introduced our “studio” system, providing structure to our efforts. Each studio team acts like an independent office, providing continuity to the client, and assuring that the individual talents of each studio member are developed. With access to the centralized resources of the full firm, the system combines the best attributes of a large and small practice. Our studio heads: Darsh Shah, Lorie Riddle, Michael Stripunsky, Neville Kermani, John Grande, Nimesh Shah, and Sabine van Riel, possess an average 22 years of experience, 15 of those years with SUPERSTRUCTURES. They are respected experts in our field. Our digital initiative took off in 1999 when Michael Fichter, our Director of Technology, joined the firm. Under his direction we’ve implemented some of the most sophisticated technology in the profession, including proprietary digital systems and applications, advanced photo documentation, image processing, and cost estimating. In 2006, we moved from our Union Square office to spectacular space in the landmarked AT&T “Longlines” building in the heart of Tribeca. Our spacious layout and 16 foot ceilings resemble the office of a government ministry in a European bureaucracy. 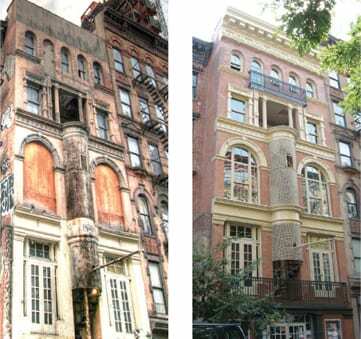 By 2008, SUPERSTRUCTURES was involved in more NYC exterior restoration projects (by fee volume) than any other professional firm. That streak has remained unbroken. The firm hired its first employee a year after opening. We’ve grown consistently ever since. Today, we number around eighty. To this day, forty eight years later, the founding partners still share an office with their desks across from each other, just a little further apart. PS: The name “SUPERSTRUCTURES”? Paul Millman saw it on the box of a kid’s toy in a K-Mart in 1981. It seemed like a good name for a firm of engineers and architects. It turned out to be true.